Pixelache is always engaged with artistic mobility and has operated various residencies in Helsinki. After the first Pixelache Helsinki Festival in 2002, Juha Huuskonen, was invited to design a residency programme called New Media Air for the Nordic Institute of Contemporary Art, focused on the Nordic & Baltic regions and Russia. Pixelache became one of the Helsinki partner organisations in this residency programme and that is how our involvement with residencies began. The first Pixelache production residency took place in 2004, with artists from Ambient TV (Manu Lucksh & Mukul Patel (UK). The collaboration with NIFCA lasted until 2006, year when the organisation was shut down. After this we have often organised production residencies in partnership with HIAP (Helsinki International Artist-in-Residence Programme). We have also used different venues such as Kiasma's guest appartment and/or Helsinki city guest rooms at Eläintarha Villa for more short-term ad hoc residencies. Residencies at Pixelache have been mostly based on invitation. The purposes of the residencies have been varied and have involved the realisation of performances, workshops, artwork and software. Our most recent production residency project is Suomenlinna Money Lab, the output of which is detailed in the book Autopsy of an Island Currency. 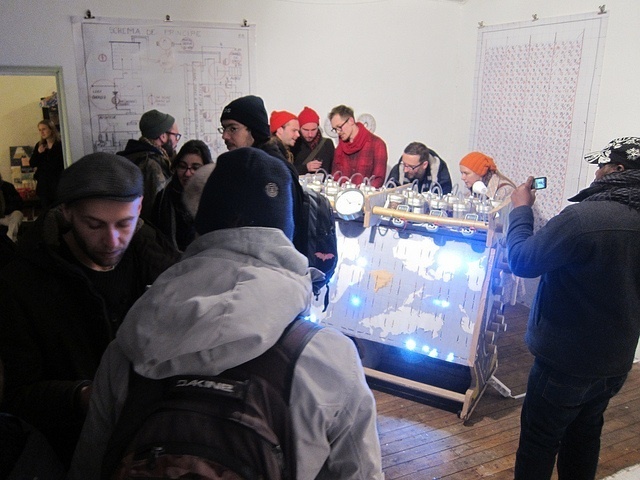 In 2012 we began a new series of Microresidencies, in which people are invited to Helsinki for periods of less than one week, focused on operations, networking and skills exchange. At the moment, Pixelache is examining how to proceed with residencies. We will likely continue both production residencies and micro-residencies in some form, though not necessarily in a regular, formal programme. Information on our past residencies can be found here, including documentation and reflections from the residents themselves.